This past weekend was a holiday weekend in Nova Scotia (and much of Canada), so we had a whole, extra, glorious Monday off to do with it what we pleased. And what a productive weekend it was chez nous! Over the course of Saturday, Sunday, and Monday I ended up testing out several dishes in preparation for a dinner party we're hosting this weekend with several of F.'s closest friends. Some were a big hit, others not, so which ones we use on Saturday remains to be seen. The theme of this dinner party is 'breakfast for dinner.' Or... Brinner? This is a simple, chilled Avocado Soup. I loved it, but F. hated it. I had a feeling he would, just because it has certain ingredients I know he doesn't like. 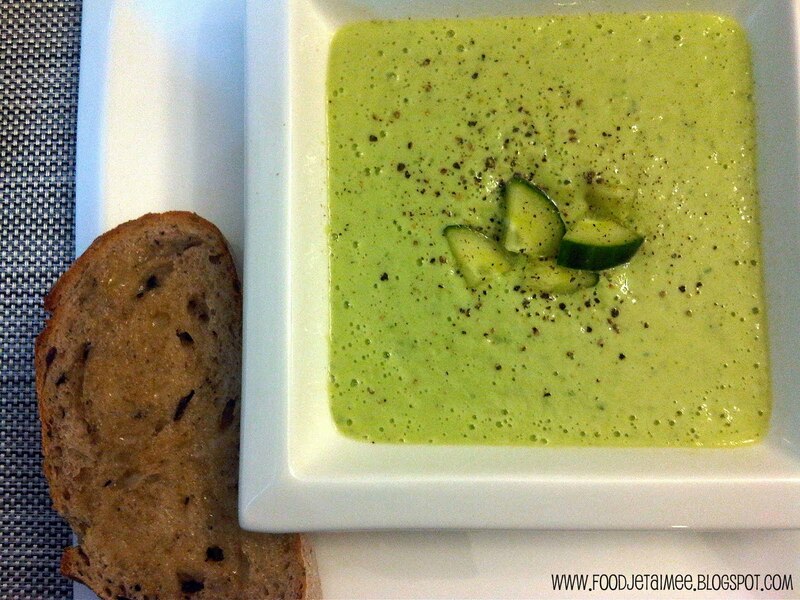 I did however agree with him on something: rather than calling it Avocado Soup, it should be called English Cucumber Soup, due to the overwhelming flavour of cucumber and complete lack of avocado flavour. I do plan on making this again, but will attempt to do its namesake more justice by adding much more avocado and much less cucumber. In any case, it was frothy, refreshing and lovely on a warm day. Find the recipe I used here. 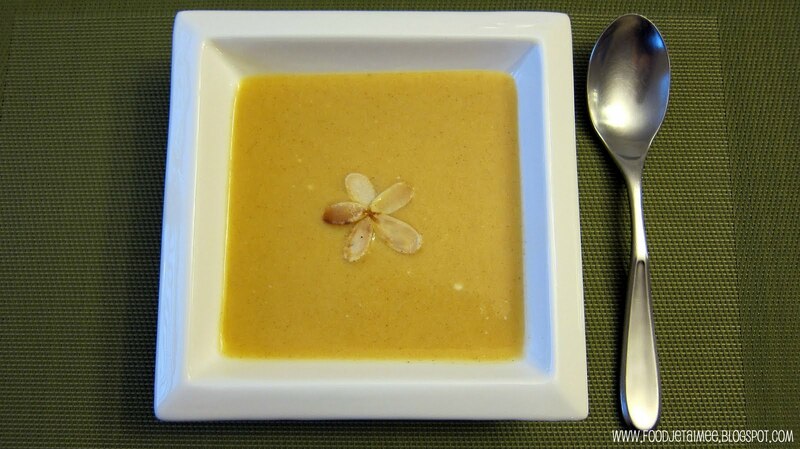 The next chilled soup I tried was this sweet and savoury Peach Soup. The recipe, from Canadian Living, calls it Spiced Peach Soup, due to the inclusion of ingredients such as cardamom and cloves, but I find it a little misleading when the end result is extremely tart and sweet. This will also be tampered with, maybe by adding some heavy cream or more yogurt, to cut down on the sweetness. The original recipe is here. Next up is homemade Mac & Cheese. This was F's brainchild, and a brilliant one it was! 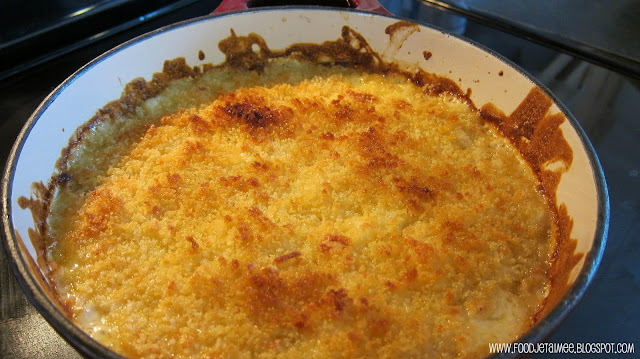 We adapted this recipe to include Panko and a different variety of cheeses. I also finally got to put my new Dutch Oven to good use, found on mega sale about a month ago at Canadian Tire. The recipe this pot of delicious was based upon comes from an awesome (and funny) food blog called The Pioneer Woman Cooks! Then - THEN - there were these little beauties. I got the recipe for Honey Vanilla Madeleines from Jamie Schler of Life's a Feast (not to be confused with the earlier Jamie I posted about, from My Baking Addiction). The gorgeous food Jamie Schler produces in her kitchen and oven can only be rivaled by her beautiful writing and storytelling. I'm completely hooked on her blog! If you haven't visited it yet, you should; it will change your foodie life. 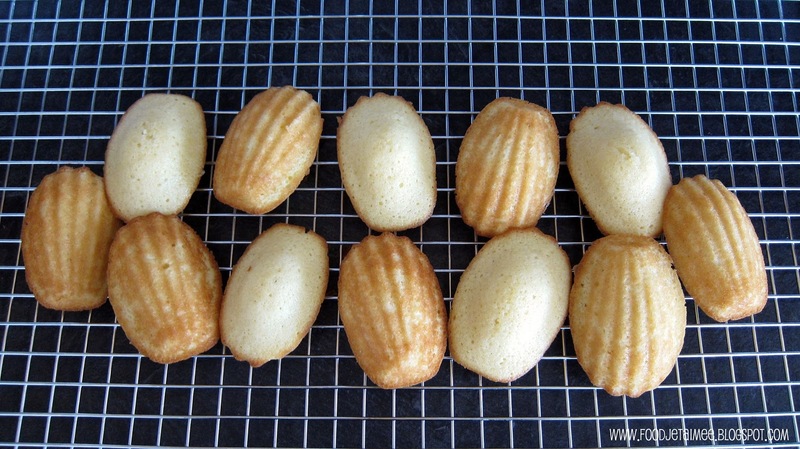 Her recipe for (mini) madeleines is here. Last, but certainly not least, I experimented with Coffee Granita from the lovely Nelly Rodriguez's blog, called Cooking with Books. Sadly I don't have a photo of it, but it was such a fun way to get my morning dose of caffeine. It may or may not have been consumed in bed that morning, along with several of the madeleines. (Is that what heaven is like?) I'll definitely be making the granita again this weekend, so I'll post photos of it then. In the meantime, here is a link (to a link) of her recipe - a guest post on another blog. Nelly - a fabulously talented CIA grad - is a new friend (albeit only through the internet - how deliciously nerdy!) who has been most generous with her time and advice on all things culinary. She is one of a small handful of food bloggers I've been getting to know a little, along with an old friend I've reconnected with, who are daily inspirations to keep trying and writing about new adventures in the kitchen. Here's looking at you Nelly, Jamie S., Alan, and Alessio. I really appreciate you guys! As a final side note, I was lurking around Twitter in pajamas on Saturday evening, when F. suggested we pull ourselves together and check out the Summerlicious Menu at Onyx. It was an excellent last minute idea, and nothing perks me up or gets me moving like the promise of good food. It's an incredible deal: $25 for a 3 course meal, plus an extra (optional) $20 for wine pairings. We loved it! It was extremely quiet because half the city of Halifax was in Moncton to see U2, but it was just what a dreary, Saturday night should be. Did you try any new recipes over the weekend? How did they turn out? Love your roundup and thrilled you not only made my madeleines but actually went out and bought a madeleine pan especially to try the recipe! And yours are even prettier than mine! Mmmm I would love a couple with some of Nelly's granità! Perfect! I am so glad I met both you and Nelly - you are both adorable, sweet and fun not to mention talented foodies that I love to follow! Here's to you! And to one day meeting you in Nova Scotia! Man, this weekend I tried breaking the ramen up IN the bag BEFORE opening it. The end result tasted pretty much the same as usual. I'll experiment more with this next time. Ha ha! <3 to you - <3 to your blog. Madeleines and granita in bed? Now that's my kind of gal. I'm sure your breakfast/dinner party was a smashing success! What a lovely lovely round up!! And gorgeous pictures too A!